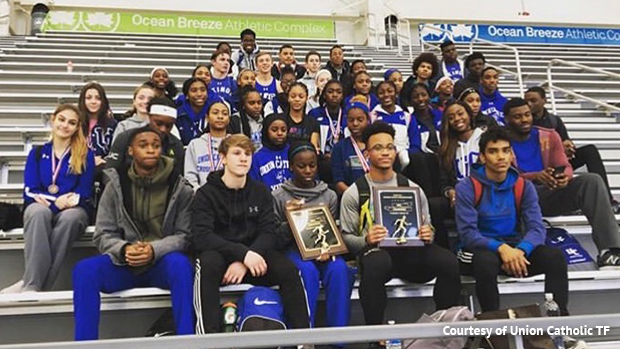 Christian Brothers Academy and the Union Catholic girls won the overall team titles, and Elijah Brown of Union Catholic ran one of the fastest 600 meter times in state history at Sunday's Wayne Letwink Memorial New Jersey Catholic Track Conference Championships at Ocean Breeze on Staten Island. CBA won the A Division title and outscored B Division winner Union Catholic, 69-64, for the boys overall championship. In the girls team competition, Union Catholic ran away with the overall team title by outscoring runner-up Paramus Catholic, 146.75-64. The top individual highlight of the meet was provided by Brown. Brown, a junior, won the 600m in 1:20.04, which is US#2 this season and #4 all-time in New Jersey history. The only three NJ runners who have gone faster than Brown are Shaquan Brown of Paterson Kennedy (1:17.9 in 2005, the national record for seven years), Clayton Parros of Seton Hall Prep (1:18.90 in 2009), and Luis Peralta of Passaic, who leads the nation this season at 1:19.14. On the girls side, the UC girls picked up wins from Jerika Lufrano in the 1,000 in 2:58.74, Sydney Tucker in the 55 dash (7.22), Chidumga Nkulume in the 300 in a NJ#1 (39.91), Leena Morant in the 1,000 (1:35.11), Hope Handlin in the pole vault (11-0) and the 4x400 relay team (3:56.85 ). Morant anchored the 4x400 in 56.5. In other highlights, Isaiah Sanchez of St. Benedict's Prep won the boys 300 in a NJ#2 34.85, Connor Melko of Bishop Eustace won the 1,000 in a NJ#5 2:31.28, which broke a 17-year-old school record, and Kennedee Cox of Paramus Catholic won the girls long jump with a leap of 18-0 1/2. Cox leads the state with an 18-10.